I hope your Thanksgiving was fabulous and that your Christmas is shaping up nicely — full of family, food and the much-anticipated change of pace that accompanies both once you finally sit down to the table. I wanted to update you on a few things between the holidays and bring to your attention some food-worthy events to put on your calendar for the New Year. The week of Thanksgiving, I had the pleasure of going hunting with a couple dozen DC chefs. I wrote about the outing that was aimed at introducing the chefs to the landscape and the unique breed of cattle that are raised on it. And I got to know some of the chefs a little better, talk to them about their kids (story in NoVA Mag next year) and eat Bryan Voltaggio’s cooking. Not a bad day, despite my poor nanny going in for an emergency root canal and my dear husband having to scramble home to cover me. Go team! 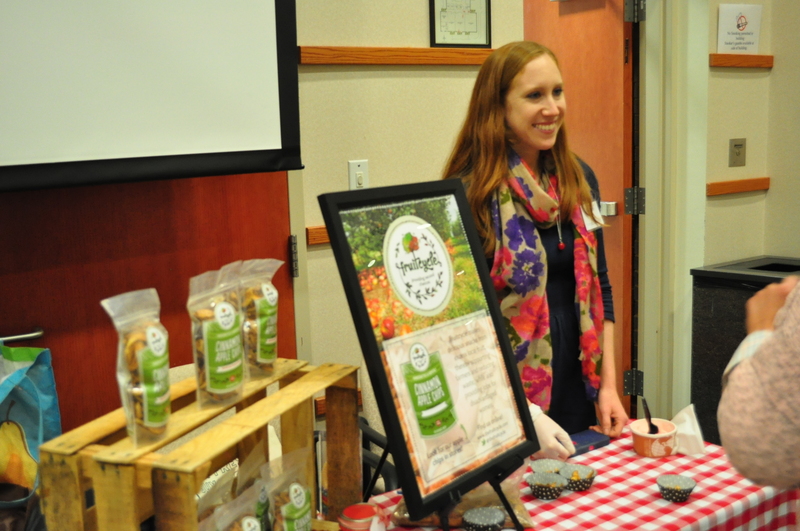 I had the pleasure of attending the Virginia Farm to Table Conference in Weyers Cave, Va., for the third year. This time, I rode down to the conference with the illustrious Elizabeth Bennett, who has just launched at Mess Hall her innovative company Fruitcycle, which turns excess orchard goodies into apple chips. After getting stuck in traffic on I-66 with her on the way back — and breaking into the apple chip stash — I can attest that they are good and great Christmas gifts! You can read about the fascinating soil focus of this year’s Virginia Farm to Table conference here: [Soil biologist dares farmers to use more microscopes, less fertilizer] and here. After the conference, we jetted (or bussed, rather) to NYC to see introduce the babe to her Auntie who was in town and to the big city at Christmas! 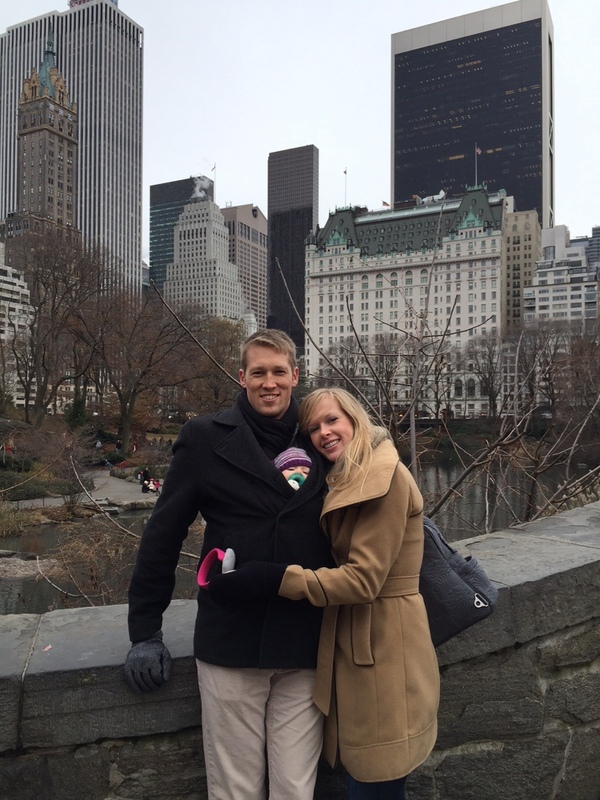 Here’s us in Central Park, with Cora peeking out from the carrier inside her daddy’s coat. Future Harvest CASA Conference, Jan. 15-17. This year’s “Cultivate the Chesapeake Foodshed” conference will include more than 40 breakout sessions over three days at the College Park Marriott Hotel & Conference Center in College Park, Md. — including one with yours truly. Deb Dramby, farmer at Willowsford, and I will be leading a discussion on blogging and social media for farmers and producers on Thursday afternoon. That’s right farmers, you too can Instagram. And your customers will LOVE IT! Come get our pointers. Attendees of the CASA conference can follow seven different tracks through the conference on topics like beginning farming or how to run a grass-fed meat or dairy operation. Foodies can learn how to make hard cider, keep bees or run a food truck. Check out the agenda here. The Chesapeake Bay Journal is co-hosting a conference on Growth in the Chesapeake Bay on Jan. 13 and 14. The conference will ask the tough questions about the reality that is population growth and whether simply managing it is enough to save the Bay for future generations. Register here. The First Annual Food Tank Summit on Jan. 21 and 22. Another irresistible conference taking place in DC this January. This one aims to bring the big policy makers and local shakers together to discuss big-picture food problems with local implications. Kathleen Merrigan, Executive Director of Sustainability at The George Washington University and formerly of the USDA, will keynote; I’ve heard her speak and she’s worth the ticket. You can also listen in on this conference for free virtually via a livestream. Who wants to come over for a watch party? And, if you’re a biological/organic/innovative farmer, another must-attend conference is the Virginia Biological Farming Association’s in Richmond, Jan. 29-31. I’ve never attended this one, but I’ve heard great things from farmers who, during the off season, are looking to brush up on their soil basics. Topics covered at the conference include bio-intensive market gardening, edible landscaping, organic orchards, urban agriculture, multi-species grazing and other ecological topics. Anything I missed? What food-and-farming conferences do you have on your calendar for the New Year? For now, I’m off to the theater (Joseph and the Technicolor Dream Coat at Ken Cen!) and then to Oklahoma this weekend for a very Merry Christmas week. Wishing you and yours an abundance of the same!